Cheese breads made from yuca root and parmesan cheese Original, Basil & Roasted Red Pepper. Three come in an order, and parmesan cheese is sprinkled over them. We recommend you start with these additively soft and chewy cheese breads. We love the basil and the red pepper cheese breads, and enjoy dipping the original one in one of the three Malagueta sauces. They pack a little heat after the initial sweetness…mmm heaven! 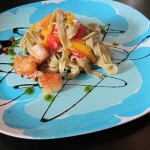 Handmade avocado pasta served cold with julienne mango, scallion, tomato and seared bay scallops. This is a fun little pasta dish. The avocado flavor was very mild, but the pasta was cooked perfectly. The mango added a pleasant sweetness, and the scallops were seared nicely. 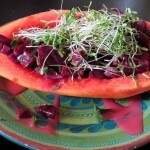 Papaya and fresh roast beets topped with alfalfa sprouts, artisan sea salt and a handmade raspberry sauce. The first thing you will notice is the beautiful presentation of this appetizer. The Maracana is a refreshing, perfect-for-summer option for anyone, but especially vegans. 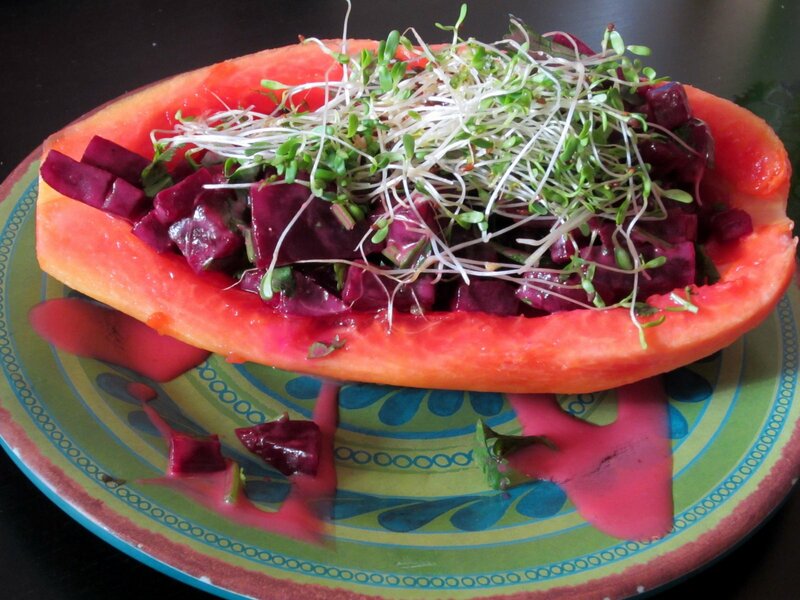 You can taste the freshness of the beets, and it paired wonderfully with the papaya. We wouldn’t have minded more raspberry sauce. We were surprised to find how much we enjoyed this dish because we don’t like sprouts too much, and papaya usually has a funky smell. Well, there was no weird odor, and the spouts added a nice dimension to the dish. Beef with tabouli, mint, onion, garlic, and tomato. 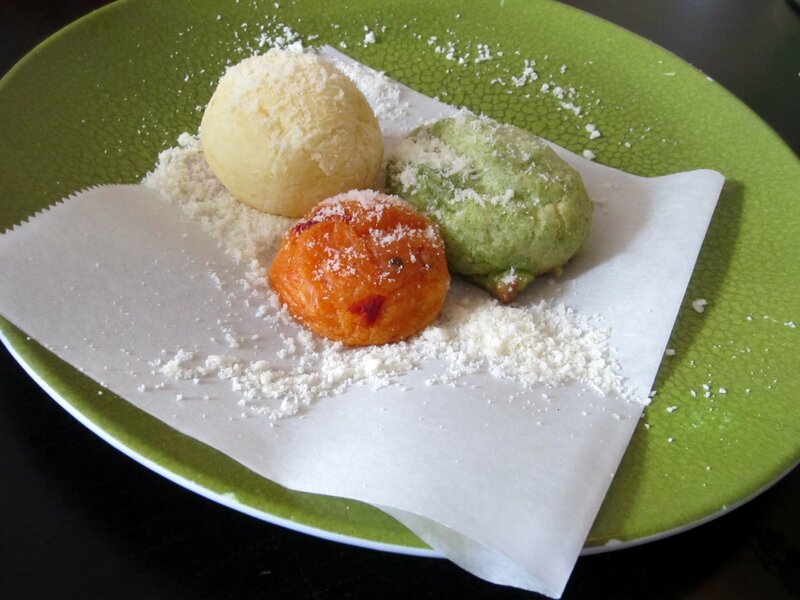 Salgadinhos are traditional & contemporary Brazilian savory pastries, served with spicy Malagueta sauce. The malagueta is a small but powerful pepper that is used in Brazil and Mozambique. The breading on the outside was a little coarse, but the inside was phenomenal. The beef was tender, and the other flavors complemented it well. It looks small but it is dense and had a spicy kick to it! Rio’s sure knows how to do salgandinhos right. Yuca root pastry stuffed with shrimp, garlic, green peppers, and tomato, rolled in toasted yuca flour. This savory pastry was addictive. How can you go wrong with shrimp, green peppers and garlic inside a soft but crunchy yuca exterior? Order this one and your taste-buds will rejoice! 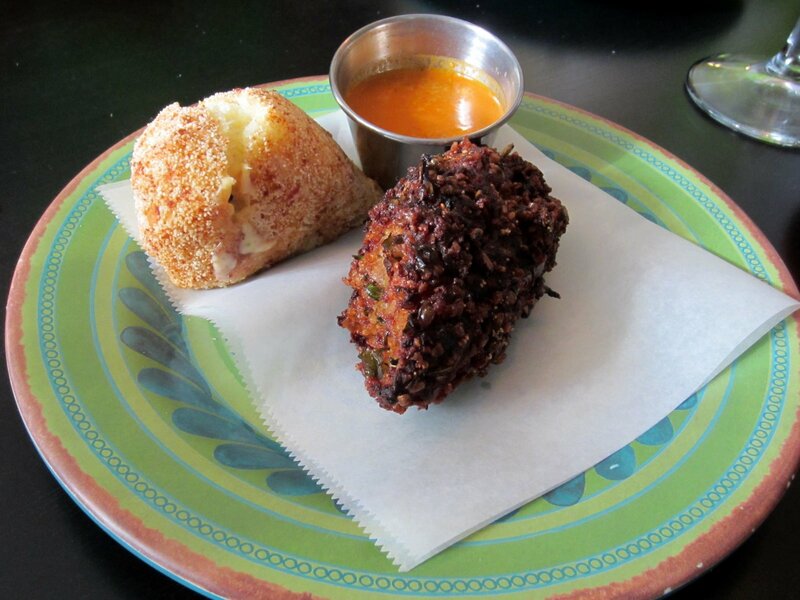 This bolinho tasted great on its own, and when dipped into the Malagueta sauce. We were happy to find another winner. 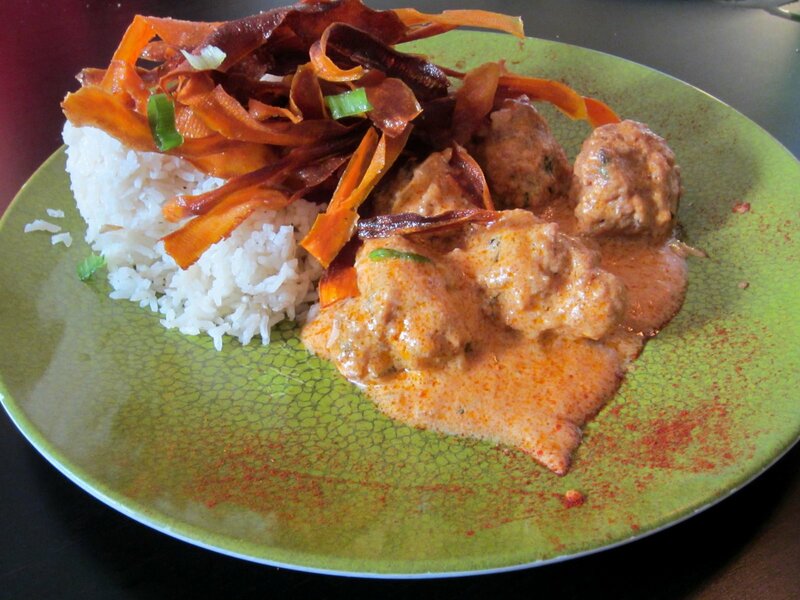 Traditional Brazilian pork meatballs made with scallion, basil and carrots, served over rice with a pink crème de leite sauce and sweet potato crisps. Wow, we have finally found another perfect-10 to add to the list! 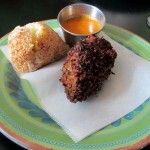 These meatballs were flavorful and savory! The pink creme complemented the pork perfectly and the sweet potato crisps added the perfect crunch to every bite. 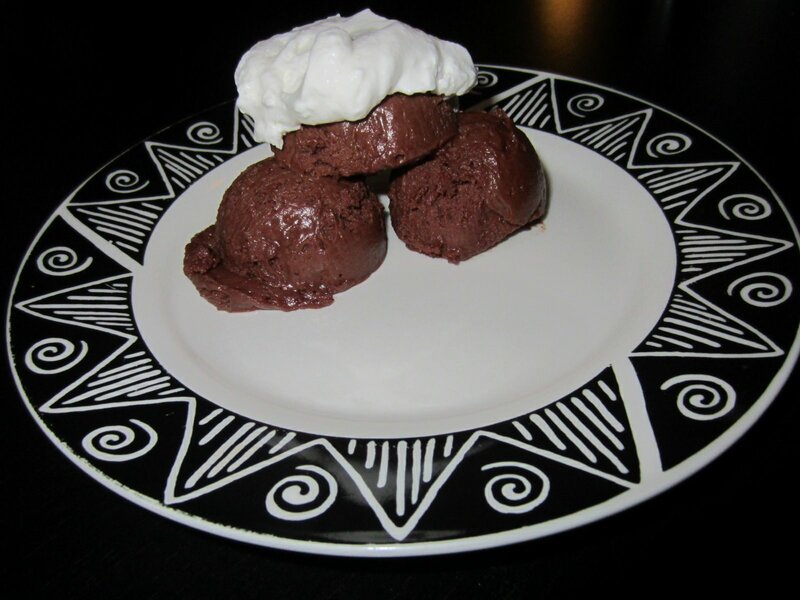 Rich chocolate and passion fruit mousse served with fresh whipped cream. Basically, passion fruit and chocolate married each other and invited home-made whipped cream to their wedding. It is a beautiful union of flavors, and a great way to end a meal. 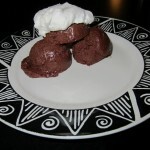 This tropical dessert is not heavy, so you will have room for it after your meal! 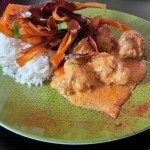 We have dined at Rio’s Brazilian several times and the service has been consistently excellent. The owners, Ben and Elias, go out of their way to make sure that everyone has a fabulous dining experience. Since we are Brazilian food newbies, we asked several questions regarding the menu and they patiently answered them. 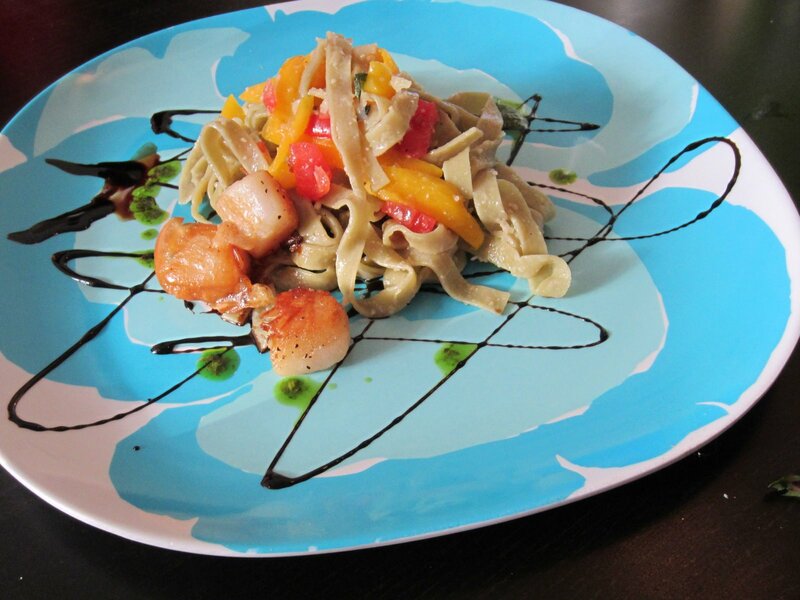 Dishes are always prepared in a timely manner and served with a smile. Rio’s also has a happy hour menu, where both food and drinks are discounted quite a bit! Often times, they will bring patrons some samples of something delicious they concocted in the kitchen. On occasion, we have to request the waitstaff to refill our water, but this is a minor issue. Our waiter seemed a little inexperienced, but eager to please. Everyone is very friendly and accommodating – it’s the kind of place where they will remember your name and your favorite dish. Rio’s is tucked away in a modest building on the East-side. You shouldn’t miss it though, because the front is painted in the national colors of Brazil – bright green and yellow. There is a great outdoor patio, where there’s often either live music, or upbeat music playing from the speakers. There is also a drive-through available for those in a hurry. The interior is charming and welcoming. Brazilian photographs adorn the walls, fresh flowers at each table, and stylishly funky furniture awaits your presence. Rio’s is a full-service restaurant by day, and turns into a vintage-hipster lounge at night. It has a truly unique vibe, and they welcome wine and coffee lovers alike. With great eats, friendly service and a casually chic atmosphere, this little cafe is one of our favorite spots in town!